TENAC is a non-profit, public service organization dedicated exclusively to tenant interests, tenant rights, and support for rent control in the District of Columbia. They are the only city-wide tenants organization, and represent all tenants in the District of Columbia. Click here to read Kent's Statement on winning the TENAC endorsement. 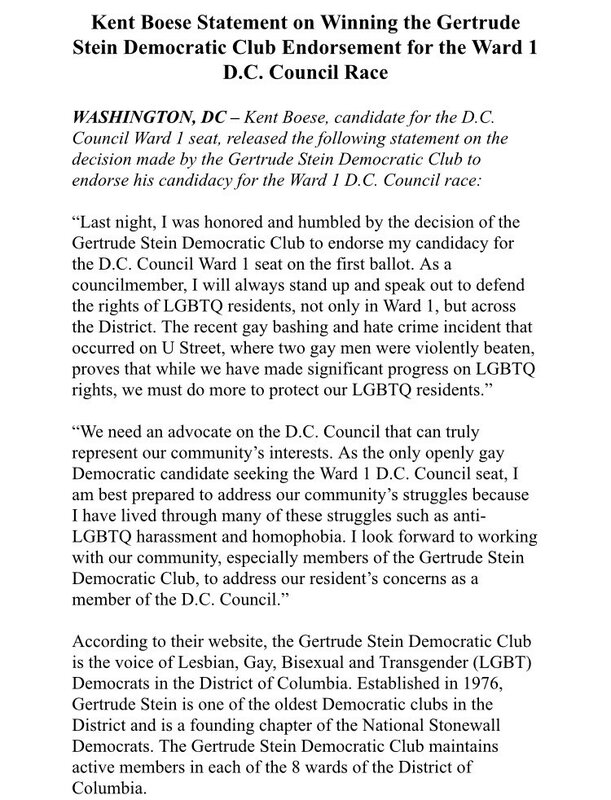 With 70 percent in support, the Gertrude Stein Democratic Club endorsed Kent Boese for DCCouncil, Ward One. Click here to read Kent's Statement on winning the Gertrude Stein Democratic Club endorsement. Click here to read Kent's statment on the Victory Fund endorsement. "I love Kent Boese because when it comes to the vacant properties around here he does do his job he does it throughly we had a vacant property across thestreet on Park Road. He up the taxes on it so that the owners would either pay the taxes or sell it. And guess what? They have recently gutted that house and getting ready to, you know, fix it up and get somebody moved into it. So keep the good work up, man. Love you, Kent!" "I am voting for Kent Boese because he really and truly cares about all Ward One residents. He is not just lip service, he gets things done. He is the Chair of our ANC, he would make a wonderful Councilmember. I am proud to support him." "Kent Boese is a thoughtful leader who has integrity. He leads with respect and works hard for all. That's why I'm voting for him." Kent received a rating of 9 out of 10, with GLAA stating: "Democratic candidate Kent Boese (+9) agreed with GLAA on all issues and offered strong substance in his questionnaire. He has a demonstrated record supporting LGBTQ issues." A copy of our report is filed with the Director of Campaign Finance of the District of Columbia Board of Elections.